The Second Battles of the Somme 1918 were fought in the summer of that year, following the German spring offensive of Operation Michael. The Allied offensive of the summer opened with the Battle of Amiens on 8 August. The French Army attacked at the same time to the south of the river Somme in the Battle of Montdidier. Ten Allied divisions were involved including Australian and Canadian forces serving with the British Fourth Army. The Allied forces surprised the Germans on the first day of 8 August and made rapid progress eastwards of several miles, taking hundreds of German prisoners on the way. The significant advance recaptured much of the ground lost by the Allies in March, earlier in the year. This battle marked the end of the stalemate of trench warfare on the Western Front, the effective combination of infantry, air support and tanks. It was the beginning of several battles from August to November 1918, which became known as the Hundred Days Offensive. The Allied success of 8 August was a black day for the German Army. The British Third Army and the United States II Corps launched the attack to recapture Albert on 21 August. The town of Albert was retaken on 22 and the town of Bapaume was captured on 29 August. The success of the Battle of Amiens continued with the Second Battle of Bapaume from 21 August. The British Third Army and the United States II Corps launched the attack. The town of Albert was retaken on 22 and the town of Bapaume was captured on 29 August. During the night of 30/31 August troops of the Australian 2nd Division crossed the marshy ground and the Somme river to make their way up the slope to the high ground of Mont St. Quentin. A German-held position on this hill overlooked the town of Péronne and provided the Germans with a good vantage point over any Allied attack in daylight. Successfully taking the summit of the hill, the Australians were pushed off it again when German reserves arrived to recapture the position. The next day, however, the Australians managed to push the Germans off the hill completely and it was finally under Allied control. The town of Péronne was captured on 1 September. The Australian units involved suffered high casualties but had achieved a great success in capturing the position, resulting in the start of a German withdrawal to the east. Butte de Warlencourt on the Somme battlefield and the Western Front Association Memorial. 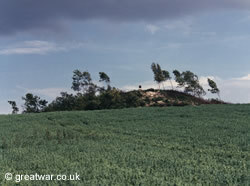 An artificial hill on the Somme battlefield has been preserved as a monument by the Western Front Association. It was the point of the furthest advance by the British Army at the close of the 1916 Battle of the Somme, was recaptured by the German Army in spring 1918 and again captured by the British Army in August 1918.